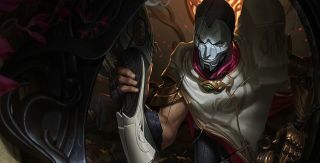 Bide your time, ladies and gentlemen, because League of Legends' new champion, Jhin, won't be rushed. He's billed as "League's slowest marksman yet", but game logic tells me that the slow tend to hit like magic-infused trucks. Jhin attacks in sets of four pretty poor shots—crits deal less damage than normal, and attack speed doesn't scale properly. Instead, he gains attack damage from speed and crit conferred by items and runes, while the fourth shot in each barrage always crits and deals additional damage based on the target's missing health. Limited attack range and the desire to save that fourth bullet make him easy to harass, but Riot has provided a range of slows and marks to compensate. His ultimate, Curtain Call, is a jumped-up version of the basic attack, revealing marked targets in a colossal range and delivering four monstrous shots with a crit to finish. Synergies, weaknesses and some less-than-enthusiastic analysis by pundits in the comments are listed here. There's also some serious philosophising on Jhin's mindset and moral compass—I guess it's the gaming equivalent of method acting.